Dokan Vendor Verification module benefits your marketplace by connecting vendor's social profiles to their storefront and also tell your customers that the vendor has a verified address and contact number. With these added to the store, customers will be more comfortable trusting your vendors and ultimately buy from them. We are breaking this process in several steps to make the workflow easier for you. Adds the widget from the backend to the storefront. Now admin is able to receive verification requests from vendors. Vendor completes the verification using ID, Address or Social Media. Vendor connects social profiles or vendor inputs Cell phone number for verification. Navigate to your WP dashboard->Dokan->Modules. Find Vendor Verification and turn on the toggle button on the top right to activate this module. 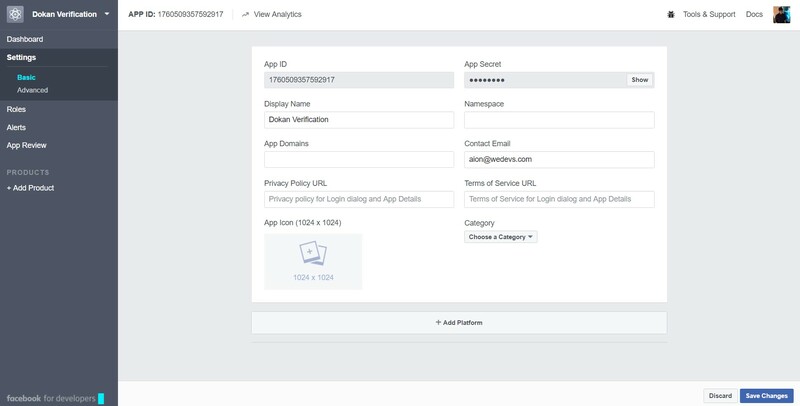 Facebook App Settings – to fill this section, you have to create a Facebook App from Facebook Developer Platform and put the App ID and App Secret on their respective fields of this page. Twitter App Settings – to fill this section, you have to create a Twitter App from Twitter and put the Consumer Key and Consumer Secret on their respective fields of this page. Google App Settings – to fill this section, you have to create a Google App from Google Developer Platform and put the Client ID and Client Secret on their respective fields of this page. 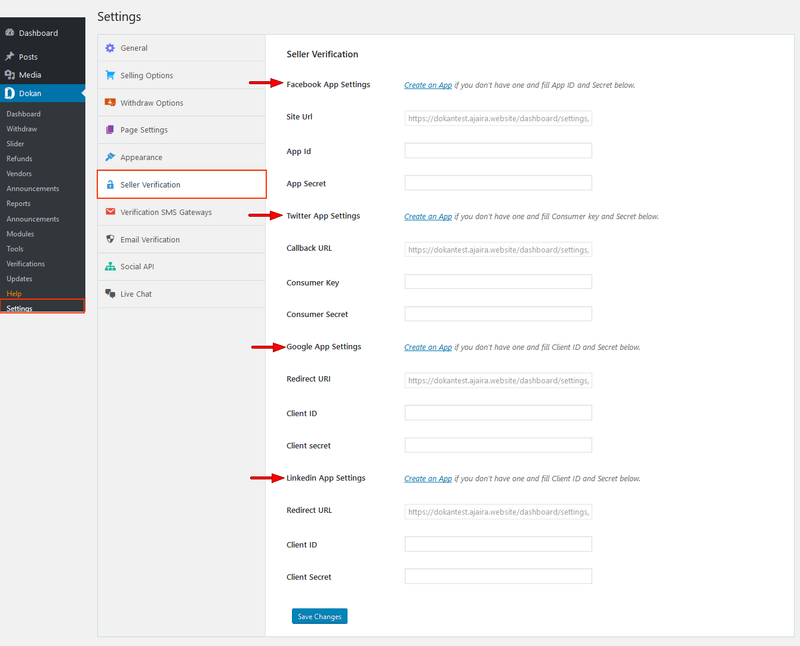 LinkedIn App Settings – to fill this section, you have to create a LinkedIn App from LinkedIn and put the Client ID and Client Secret on their respective fields of this page. Please note that, you will find either site URL, callback URL, Redirect URI and Redirect URL under their related platform. 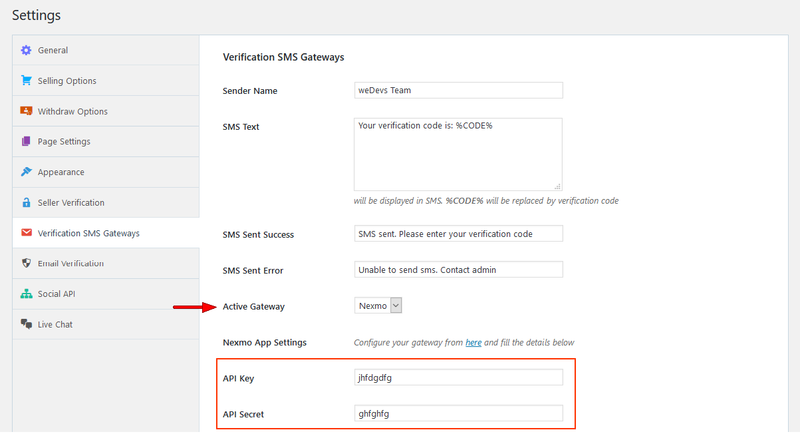 This page will allow you to configure all SMS notification settings for vendor verification. 2. At first, you have to create an App. 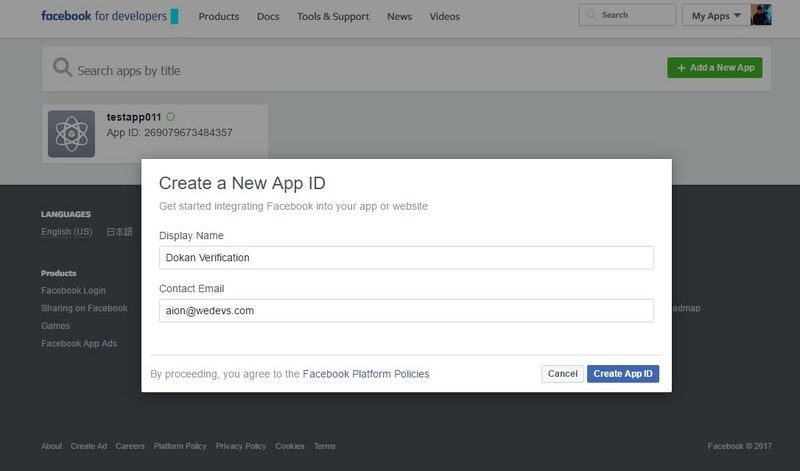 If you already have an app created just use its credentials. Otherwise, click on the Create an App button provided beside Facebook App Settings. You will be redirected to Facebook Developer platform. Sign in with your Facebook ID and click on the Add a New App button. You will see a popup. Now, enter your App Display Name and Contact Email. Then click on the Create App ID button. 3. You will be redirected to the Dashboard of your App. Select Facebook Login. 4. Click on the Settings from the left menu bar. You will get the App ID and App Secret. You have to copy these two keys and paste them on Dokan Vendor Verification Settings page. 5. In this stage, you have to specify a platform. Click on the Add Platform button. 6. Select the platform you want to add. In case of Dokan, we will be adding Website platform. Thus, click on the Website icon. 7. Now, copy the Site URI for Facebook Settings given from the Vendor Verification Settings page. Paste the Site URI on Site URL under Website Section on Facebook App Settings page. a) after you log into Facebook to create app, you have to navigate through Settings>Advanced>Share redirect domain whitelist. Paste the Site URL of your Dokan settings. b) navigate through Facebook login>Settings>Valid OAuth URI. Paste the Site URL of your Dokan settings. 8. Click on Save Changes. 9. 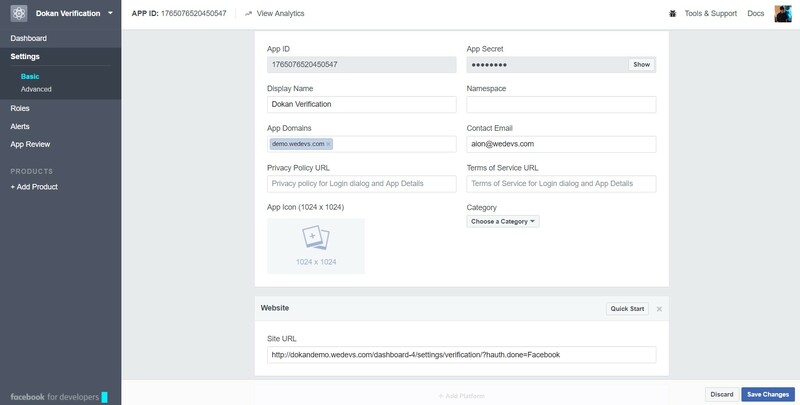 Then add the App Domains including the sub domains (if any) in the App Domains field. Basically, this is the domain of your Marketplace's web URL, so copy and paste it here. 10. Finally, click on the Save changes button and you are done with creating your App. And add drag the widget into the Store panel to the top right. Please note that the verification widget only appears on the storefront and no other pages. Admins can Approve or Reject verification requests from WP Dashboard>Dokan>Verifications. ID and Address verification do no require anything to be configured separately. But Admins need to manually approve Photo ID and Address. To approve Photo ID and Address, admins need to simply hover over the request. The Approve|Reject buttons will appear. The check-marks and cross-marks will indicate which fields have been approved and rejected. An approved field will make the request move to the Approved tab automatically. Admins can undo the action and Disapprove the field again. If a field has been rejected by the admin, the request will automatically move to the Rejected tab. Admins can still Approve or make the field Pending. The module also has a feature to send SMS to verify the contact number of the vendor and match it with his profile. 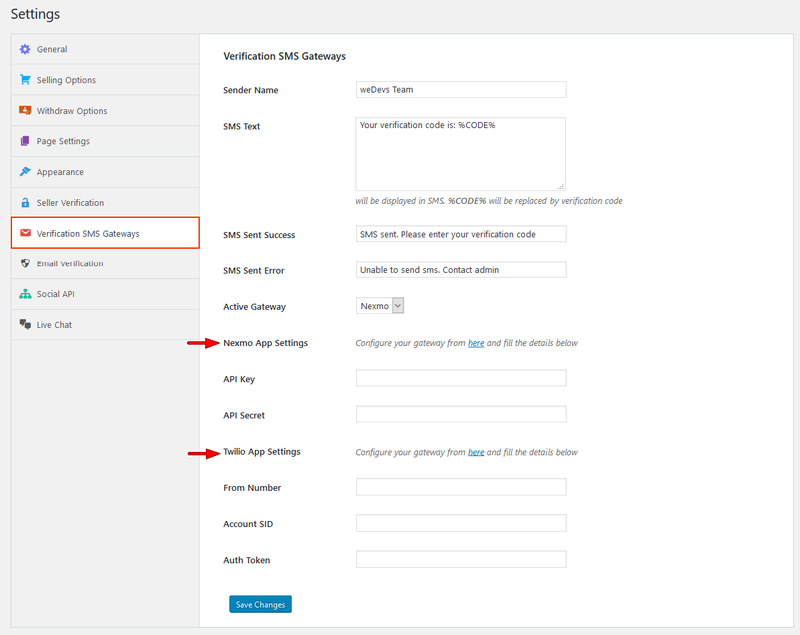 1.To do this go to WP Dashboard → Dokan → Settings → Verification SMS Verification. In this tab, you have the all the required fields to populate from the service provider once you have registered with them. Everything else is plain and simple. 2. We have implemented two famous SMS gateway service providers, Nexmo and Twilio. Simply click on the gateway links provided in the instruction to obtain the API Key and Secret for Nexmo, and SID and Auth Token for Twilio. Any of them can be used considering your needs and user base. Even you can have accounts with both providers and place the credentials and switch anytime between them. The SMS system works through a 3rd party SMS gateway provider, who will white label your SMS's and send automatic messages to the vendor's phone. It is totally optional and will not send more than 1 SMS, only when you want it to verify. So you do not have to worry about SMS charges. That's all about configuring the Vendor Verification module for Dokan.